Food to Fork – making composting bays from scratch! 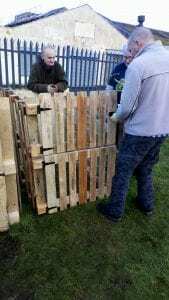 A great time was had by all upcycling pallets into great composting bays, lined with chicken wire and with two bolted doors to stop the compost spilling out but to allow easy access for getting out the better rotted material at the base of the heap! 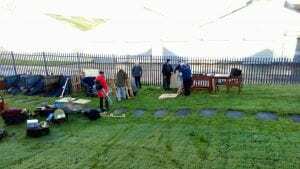 ‘Food to Fork’ runs cookery classes and has a well-established strip of grass at the back where there are several raised beds and a substantial polytunnel constructed by their volunteers with a wooden frame and plastic sheeting. 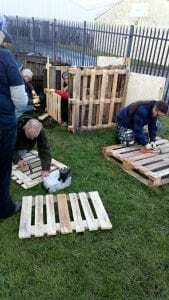 They run a free volunteer gardening group on a Monday from 10 – 12 where you can pick up great gardening skills and even rent a raised bed to grow your own produce.